Are you a poetry aficionado in London? 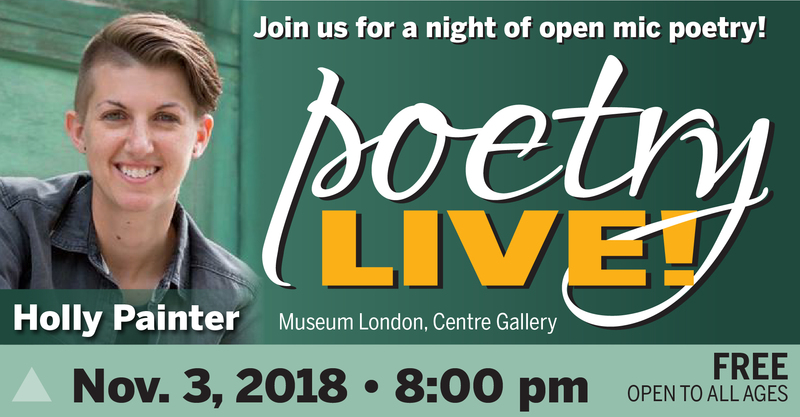 Join us for Poetry Live!, an evening of open mic poetry at WordsFest London Canada, featuring Holly Painter! Bring a poem, bring your friends! Everyone is welcome to join us for an evening of poetry, literary trivia, food and drinks as part of the Words Festival! Over the course of the evening, our host extraordinaire, Holly Painter, will open the floor to poets of all shapes, sizes, and varieties! When you arrive at Museum London, you can register to read your poetry at the sign-up desk. Come on down to Words and read your poetry on Saturday night! This event is held in partnership with London Poetry Slam, London Open Mic Poetry, and Poetry London.